“Evolution is a fact!” exclaimed Dajani. She paused and added, “There is no contradiction between Islam and evolution.” Yet there are still many Muslims who refuse to accept evolution. Dajani mentioned that although On The Origin of Species was published in 1859, Arabic versions of the text were only published in the 1960s — nearly a century later. Even after the translations were in circulation, there were still many language barriers present with terminology such as “creationism” being widely misunderstood. In addition to the linguistic barriers, Muslim communities in the sixties lacked scientists and scientific institutions to verify and explain Darwin’s findings. Lacking the necessary linguistic and scientific tools, Muslim communities instead adopted the Christian stance on Darwin’s proposed theory of evolution, mainly because of Islam’s close ties to Christianity. Both are monotheistic religions and Muslims recognize the prophethood of Jesus. It was determined that Darwin’s theory was in direct contradiction with holy scriptures, and so human evolution was dismissed in both Christian and Muslim communities. A literal interpretation of religious texts resulted in instant, perfect creation being the predominant idea back then; questioning it was seen as blasphemy. Dajani notes, “Evolution doesn’t counter the existence of God. 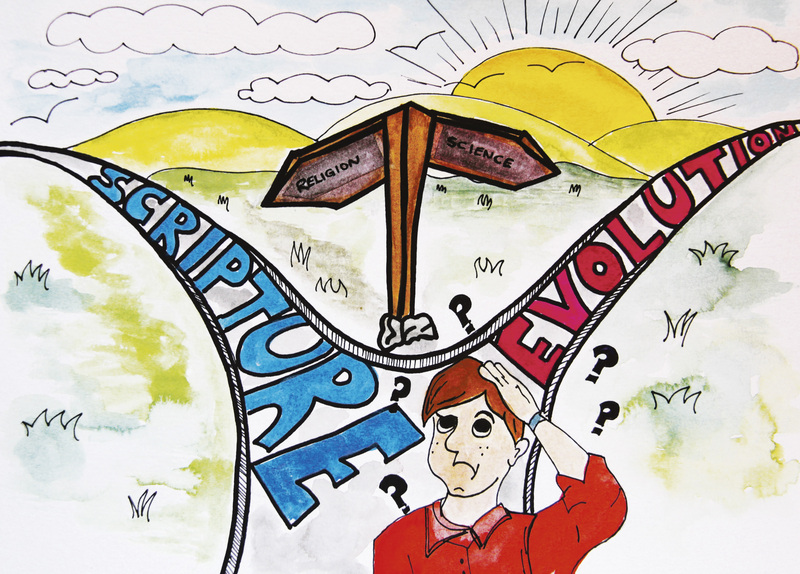 Darwin never discussed the creation of life but rather its evolution.” This demonstrates the need for healthy questioning in both religion and science to dispel false notions and encourage intellectual growth. Although today many Muslims accept evolution, there are still misconceptions. Muslims who refuse to believe in evolution often cite their interpretation of religious verses from the Holy Quran such as the creation of Adam. The story of Adam and Eve, if taken literally, is thought to imply the instant creation of humans as we are today. However, Dajani believes the story of Adam and Eve is metaphorical and cautions against using holy scriptures as scientific textbooks. The Holy Quran is a guide, not a science textbook, meant to inspire humanity to seek knowledge; supporting scientific claims through associating verses from holy scripture sets a dangerous precedent. First, discussing and questioning the claims can become taboo due to its association with a religion. Secondly, scientific theories could be disproven as time passes and in the process undermine the religion. Dajani noted “that the beauty of the Quran is that people can have different opinions.” In Islam, personal interpretations of religious texts are allowed and encouraged. It is also acknowledged that interpretations may change over time. Dajani strongly advocates for the need to separate religion from the scientific process to avoid contradictions and pseudoscience. The lecture was hosted by MCIS, which was officially launched on a provisional basis this semester. According to its website, the centre aims “to explore the interactions of science and religion in Islamic societies, both past and present, and to advance policy and educational proposals based on that exploration.” Professor Ehab Abouheif, a founding member of MCIS and Canada Research Chair in Evolutionary Developmental Biology, explained that the centre is branched into three components: policy development, history, and education. The centre will aim to propose policy to encourage scientific development in Muslim countries. In an interview with The Daily, Abouheif said “If Muslim countries don’t embrace basic science and build upon their scientific capabilities, they will remain technology consumers and not technology innovators.” This reliance on predominantly Western nations for development is noticeable in the Middle East, with governments in countries such as the United Arab Emirates often being reliant upon expatriates within academia and industry. Local scientific development could help build confidence and inspire innovation to ease the reliance on imported technologies. However, innovation and technological independence remain a distant future. Scientific development is significantly hindered with the majority in many Muslim countries not ready to accept evolution, an organizing principle of biology. Abouheif added, “There are going to be other issues that are very difficult in challenging Muslims and the way Muslims think.” He argued for the need for centres and initiatives like MCIS, which provide platforms for experts from various disciplines such as the sciences, religion, and history to have open discussions, to address topics such as evolution, and counter public misconceptions. Currently, science remains a predominantly Western system with North American and European epicentres. This begs to question whether you can take a Western system of science and put it in a Muslim country that operates on different ideals. “I don’t think that is going to work, because scientists, after all, are human. Science is a cultural practice just as much as it is an objective method. Different cultures can bring different scientific practices to the table,” Abouheif said. In the current secular society, there is an expectation for research results to provide clear applications in the real world and immediately benefit society to its justify funding. This suppresses scientific investigations where there are questions, whose solutions are without any obvious merit to society. But investigating such questions helps us gather new facts and accumulate knowledge which then leads to innovation. Unfortunately, basic science is experiencing a problem with due to a shortage in funding. Islam encourages and rewards the pursuit of knowledge. In Islamic countries, investment in the sciences would be a priority, the motivation for investment being philanthropic instead of result-oriented. Religion and science can compliment each other. For example, religion can act as a catalyst for scientific research, a motivation, and a spark for ambition. Scientific discoveries can then provide new insights of understanding in religious texts. Unfortunately, the current Western scientific system remains inaccessible, especially to scientists from developing countries due to the lack of access to necessary equipment and colleagues. Even with better communications due to the advent of the internet and tools like Skype, the inaccessibility gap is still present, posing challenges to universities in the Middle East and countries like Pakistan. There are intricate boundaries between science and religion, and while there are differing opinions on how they can work together, everyone agrees more discussions are needed.